Jesus taught mysteries and secret teachings to his disciples including several women. He did this for various reasons. The Gnostic gospels give us a glimpse of what he taught to those fortunate few. "These are the secret words which Jesus spoke, and which the twin, Judas Thomas, wrote down." "... the companion of the [Savior is] Mary Magdalene. [But Christ loved] her more than [all] the disciples, and used to kiss her [often] on her [mouth]. The rest of [the disciples were offended] ... They said to him, "Why do you love her more than all of us?" The Savior answered and said to them, "Why do I not love you as (I love) her?" "I am not your master. Because you have drunk, you have become drunk from the bubbling stream which I have measured out. ... He who will drink from the bubbling stream which I have measured out.... He who will drink from my mouth will become as I am: I myself shall become he, and the things that are hidden will be revealed to him." Let's break down these strange yet revealing quotes that Elaine Pagels included in her introduction. There are three points to be gleaned from this simple statement. The first is obvious, there are secret teachings. Why are there secret teachings and why did Jesus teach in parables? Jesus knew that the teachings from God had been changed. The Jews followed the dead letter of the law. The Old Testament Prophets' admonishments and wisdom had been filtered over the years, no longer reflecting the vibrancy of the Word. Jesus saw the distortions of the Divine intent in other major religions as well. On his travels through India during his "lost years," he witnessed the hoarding of the mysteries of God by the Brahmins, keeping the 'little people' in their place. He saw that the major religions of India: Hinduism, Buddhism and Jainism, had devolved. Vital elements for self mastery were missing. There is no doubt whatsoever that Jesus knew that the Bible would be changed in the future both unconsciously and on purpose. Important teachings would be taken out such as: karma, reincarnation, the rigors of the Path, the Divine Feminine within and the importance of women, and the most valuable teaching of all, that we are all Sons and Daughters of God. To safe guard the teachings for future generations he taught the 'mysteries' and 'secret' teachings to the select few. They were intended to not only transmit this information personally, to those they met on their travels but also to future generations as they reincarnated down through the centuries. 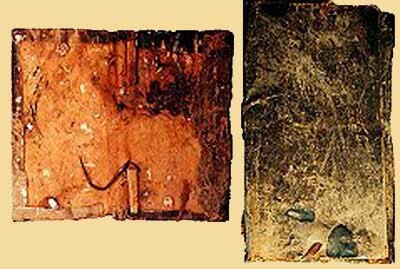 They were western tertons (buddhists monks and lamas who were with Padma Sambhava a few centuries after Issa left Tibet and who were told they would reincarnate in this age with Padma Sambhava's message). Jesus was also well aware of the guru\chela relationship. The twelve disciples, Mother Mary, Mary Magdalene, Martha, Lazarus and others were his chelas. The guru always transmits the inner mysteries to his chelas. Not everything we need to know is in the Bible. The second point is obvious. He had a twin? That is mind boggling to say the least. Can it be true? Who's to say? Maybe it refers to some sort of metaphysical concept. The third point is this, if it is true then there are some disturbing implications. Since Jesus was supposedly born of a virgin birth, wouldn't the twin be a "Son of God" also. Judas Thomas has never been mentioned as equal to Jesus. Therefore, maybe the so called virgin birth was a myth concocted later to further remove Jesus from us. If Jesus was born like Judas Thomas and you and I, then we all have a chance to be Sons and Daughters of God. Mark was the first Gospel to be published and makes no mention of a virgin birth. Mathew and Luke were drawn from Mark and yet strangely enough, added the virgin birth. The Book of John makes no mention of it. Maybe the meaning of 'virgin' was something different in the languages of the day. Maybe Mother Mary had a virgin consciousness that was able to hold the immaculate concept for Jesus throughout conception and during his young life. We have a Divine Plan and the Light of God within us. If we bring forth the light and love within, it will transform us. More light and more love will return to us on the karmic return. If we do not become one with the light and love of God within our hearts but instead turn to darker emotions then that negativity will become an anathema to the Christ within. To put it another way, nearly every person who goes through the near death experience and is able to remember, finds out that God and the Spiritual Heirarchies do not judge them. They themselves are their own judge. The Christ within and their own conscience are their judges. The Cosmic Beings showing the souls the karmic record radiate pure love. The Light of God encompassing our souls has an innate intelligence. It cannot be fooled. There will be a reckoning some day, some lifetime, when the karmic clock runs out. Gian Girolamo Savoldo, 'Saint Mary Magdalene approaching the Sepulchre', about 1530. Talk about disturbing pictures. But why? Have we been programmed to think Jesus acts a certain way? He is not like us, is he? According to esoteric teaching brought forth not so long ago, either by the Summit Lighthouse, The Bridge to Freedom or possibly, The I Am Movement; Mary Magdalene was Jesus' Twin Flame. We all have one twin soul who was created out of the same undifferentiated substance of Light many, many lifetimes ago. As the sphere separated out from God forming the Yin and Yang, male and female, twin flames are born. Each has the same blueprint. We all make karma so we are not always fortunate to be with our twin flame in each life. 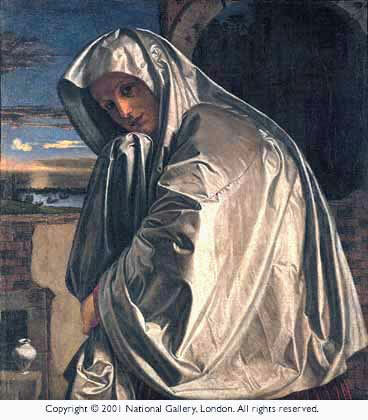 Mary Magdalene could not help but be drawn to her twin flame in that life. He had realized and become the Christ. No stronger magnet exists. He was an irresistible force. A whole cottage industry of books has emerged revealing that Jesus did marry Mary Magdalene and that they had children. Two books on the subject are listed below, Holy Blood, Holy Grail and Bloodline of the Holy Grail. I recommend pursuing this line of research. It is fascinating. Unfortunately too much emphasis is often times paid to the physical bloodline of Jesus. The metaphysical concepts of the Blood being the Holy Spirit and the Grail being the Christ chalice within, are pushed aside. Mary Magdalene died in 63 AD in southern France. Various esoteric gnostic sects of Christianity throughout history have always held Mary Magdalene in the highest regard, even revered her. She was a true chela and one of Jesus' best disciples hence his last statement: "Why do I not love you as (I love) her?" This was not a reference to twin flames but to her devotion to the Path. She may have been a prostitute but the verdict is still out on that one. There is no definitive statement in the Bible that she was. Does it matter? Jesus cast out the demons that inhabited her and she was forgiven. The Sadducees and Pharisees chose not to condemn her after challenged by Jesus. Peter's jealousy and possible hatred of women probably had something to do with the Catholic Church's position on Mary Magdalene and women in general. The Master states he is not the master. Well that is rather blasphemous I must say. 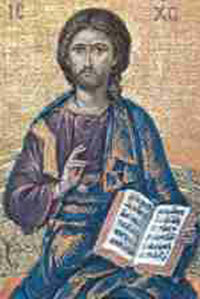 The Gospel of Thomas will never be allowed in the Bible for that satement alone. Continuing, if we drink from the same fount as He did, the bubbling stream of light that is the Christ consciousness, then we will become like him. It was his mission to show us the way, to be the example for an age. His victory measures out a portion of the office of Christ that he became if we truly walk the inner mysteries. If we put on the mantle of Christ, all that was taught secretly will be revealed. Jesus said to them, "When you make the two into one, and when you make the inner like the outer and the outer like the inner, and the upper like the lower, and when you make male and female into a single one, so that the male will not be male nor the female be female, when you make eyes in place of an eye, a hand in place of a hand, a foot in place of a foot, an image in place of an image, then you will enter [the kingdom]." Verse 22. When you so identify with the light within; when you make the lower self like the God above, the Mighty I Am Presence; when you purify your chakras, the upper chakras magnifying the alpha or masculine and the lower chakras the omega or feminine energies; when you do these things the Christ image will descend down the crystal cord directly above and super impose itself over you. At that moment, Jesus will be with you. The Kingdom of God is not in some antiseptic corner of the universe. Do these things and you will be aware of it. The door will be open. You will already have entered.